Date and time: March 1, 2016, 5:30 p.m. to 7:30 p.m. Location: Baruch S. Blumberg Institute at the Pennsylvania Biotechnology Center of Bucks County, 3805 Old Easton Road, Doylestown, PA 18902. The Baruch S. Blumberg Institute and The Commonwealth Medical College (TCMC) will hold an open house for participants to learn about a new Master of Biomedical Science (MBS) program and meet with faculty, admissions counselors and financial aid representatives. Tours will be conducted of the Blumberg Institute, which is headquartered at the Pennsylvania Biotechnology Center, an innovative biotech incubator housing more than 40 biotech start-up companies. An informal question-and-answer session will conclude the event. With proximity and access to both world-class research tools and world-class research minds, The Commonwealth Medical College’s MBS Program at the Blumberg Institute represents a major advance and a radical re-imagining of the MBS degree. Not only will the program connect students with researchers and entrepreneurs, it also will be offered in a format – at night and on weekends – that opens a path to the MBS degree to working adults looking for a distinct learning environment in which to pursue graduate study – an incubator of companies. Faculty include both TCMC and Baruch S. Blumberg Institute scientists and researchers. For more information or to register for the event, prospective students can call TCMC at 570-955-1313 or visit http://www.tcmc.edu/MBSDoylestownOpenHouse. 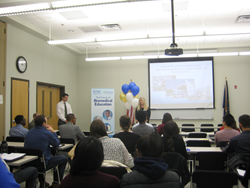 Photo Caption: Dr. John Kulp, Assistant Professor and Director of Academic Programs at the Baruch S. Blumberg Institute (left) and Dr. Michelle Schmude, Interim Associate Dean for Admissions and Financial Aid, Assistant Professor, The Commonwealth Medical College (right) speak to students interested in the Master of Biomedical Science program. The Commonwealth Medical College (TCMC) is one of the nation’s newest fully accredited medical colleges. TCMC offers a community-based model of medical education with campuses in Scranton, Sayre, Wilkes-Barre and Williamsport. TCMC offers a Doctor of Medicine (MD), Master of Biomedical Sciences (MBS), and MD/Master of Public Health (MPH) dual degree. The college’s innovative curriculum, focused on caring for people in the context of their lives and their community, attracts the next generation of physicians and scientists from within its 17-county region in northeast and north central Pennsylvania as well as from across the state and the nation. The Commonwealth Medical College is committed to non-discrimination in all employment and educational opportunities. Visit tcmc.edu. About the Hepatitis B Foundation: The Hepatitis B Foundation is the nation’s leading nonprofit organization solely dedicated to finding a cure for hepatitis B and improving the quality of life for those affected worldwide through research, education and patient advocacy. To learn more, go to hepb.org, read our blog at wp.hepb.org, follow us on Twitter @HepBFoundation, find us on Facebook at facebook.com/hepbfoundation or call 215-489-4900.